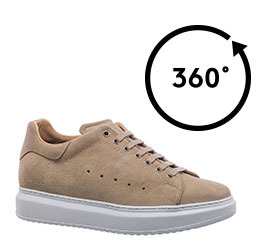 Handcrafted elevator sneakers with soft upper in sand suede and super light natural rubber sole. A must-have shoe featuring an iconic and casual design with an inner elevator system able to increase height by 2.6 inches (6.5 cm) in total comfort and secrecy. Made in Italy.